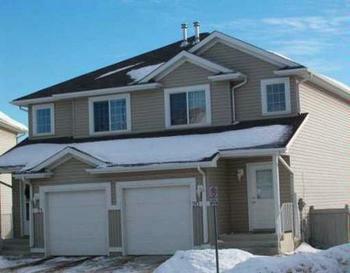 Your new 3 bedroom half duplex is in an IDEAL location! RIGHT close to Manning Drive and 153 Ave, your transportation worries are taken care of!! Nice, open concept throughout your new home. Over-sized attached garage out front makes parking a breeze!! Your carpeted living room has patio doors leading to your deck and back yard - one of the biggest in the complex!! Your kitchen has everything you'll need including cupboard and counter space!! Excellent condition. Over 1200 sq feet of living space. Act now!! This corner unit at this price won't last long!! Call 780-701-7401 to see your new home today! !